BBC One Scotland will provide live coverage of Hibernian v Dundee United in the Scottish Cup semi-final on Saturday lunchtime. United's first ever match, under the guise of Dundee Hibernian, was a friendly to mark the opening of Tannadice in which the Hibs from Dundee faced the Hibs from Edinburgh on August 18 1909. A crowd of 7,000 witnessed the 1-1 draw, 15 years before the two sides met competitively for the first time in the Scottish Cup. Since then Hibs have tried and failed to reclaim the trophy, while United suffered a long Hampden hoodoo of their own before landing it in 1994 and once more in 2010. Hibs are still reeling from last month's League Cup final defeat to Ross County, while Dundee United are trying to replace memories of the 2014 Scottish Cup final loss to St Johnstone. Can this be the year both put to bed recent cup heartache? 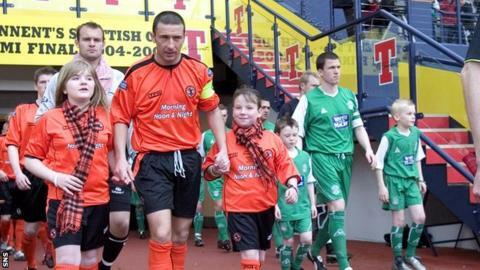 BBC Scotland takes a look at five previous occasions when Hibs and Dundee United have gone head-to-head in cup competition. Back in 1990 it was Dundee United's Cup hoodoo in the headlines. After failing to win nine cup finals at the national stadium between 1974 and 1988, United fans worried they were the victims of a Hampden jinx. For Hibs it had been a mere 88 years since their last success. Hibernian v Dundee United in the Scottish Cup. The season was similar for both, with just a point separating them by the end of the season. Their respective Uefa Cup adventures were both ended in round two by Belgian opposition; Royal Football Club de Liege edging Hibs out by a goal and Dundee United failing to overturn a 4-0 first leg defeat to Royal Antwerp. Therefore it was no surprise the quarter-final tie in front of 13,874 at Tannadice was settled by just a single goal. It was to be in the home side's favour with Darren Jackson, who would be a pivotal figure in this fixture for both clubs, getting the only goal of the game. United would have to wait a little longer to end their Hampden heartache with eventual winners Aberdeen ending their dreams in the semi-final and Motherwell winning a seven-goal thriller in the following year's final. Dundee United were under new management for the first time in 21 years and seven months after Jim McLean had stepped down. The charismatic Ivan Golac was now the man in the dugout and he promised trophy success for the Arabs. After ending a 19-year wait for a major trophy, Hibernian were eyeing a second League Cup in three years. Both sides made it to the Tynecastle semi-final virtue of epic quarter-finals; both needing penalties after United had drawn 3-3 with Falkirk and Hibs had shared four goals with Partick Thistle. A crowd of over 19,000 saw Darren Jackson again become the goal hero, but this time in the colours of Hibs. Despite a barrage of Dundee United pressure, goalkeeper Jim Leighton was in inspired form and saw Alex Miller's men into the Celtic Park final, where an Ally McCoist overhead kick won the trophy for Rangers. Dundee United did not have long to wait to lift the promised silverware - winning the Scottish Cup at Hampden a few months later. The two sides met hoping to save poor seasons for both. Dundee United were in the midst of what would end up being statistically the club's worst season since before World War Two. Paul Hegarty was the second man in charge that season following the sacking of Alex Smith. Things were not going much better down the east coast in Leith in manager Bobby Williamson's first season in charge. Languishing in the bottom six, just three weeks before this game would come the infamous 4-4 draw against Edinburgh rivals Hearts, with the Hibees somehow throwing away a two-goal lead in time added on. Grant Brebner, who like Jackson would go on to star for both clubs, was the hero Hibs were desperately crying out for. His two early goals though were cancelled out by a late Dundee United surge, who had Daniele Chiarini making the first of only five appearances in a tangerine shirt. However, Brebner headed in with just three minutes remaining to complete his hat-trick and seal a place in the fourth round. Hegarty lasted just a few more days in the job before he was replaced by Ian McCall. They would avoid the ignominy of finishing bottom, with that honour going to Motherwell. Hibs' cup dreams lasted until the following round when Dunfermline knocked them out in a replay. Ian McCall's tenure lasted until a month before the Scottish Cup semi-final in 2005, with Gordon Chisholm taking charge. In the league, United continued to struggle and went into a remarkable four-way fight to avoid relegation on the final day of the season. A Barry Robson goal away to Inverness CT preserved their top flight status, with city rivals Dundee instead going down. Their cup prowess was much better. They made it to the League Cup semi-final before a humiliating 7-1 defeat to Rangers, but they redeemed themselves in another run to Hampden; hitting 11 goals in their three ties to set up a date with Hibs. The Hibees were enjoying more success than their opponents in the league and Tony Mowbray's men would go on to secure third place and a Uefa Cup spot on goal difference. Boasting a squad including Gary Caldwell, Ian Murray, Steven Whittaker, Scott Brown, Kevin Thomson, Steven Fletcher, Gary O'Connor and Derek Riordan - players who would go on to make nearly 200 Scotland appearances between them - they went into the Hampden semi-final as big favourites with the majority of the 27,271 crowd wearing green and white. Things looked to be running smoothly. Hibs dominated the first half then Riordan fired home a penalty after Robson hauled down Dean Shiels. But Robson made amends by jinking into the box and squaring the ball to Jim McIntyre who forced home the winger's low ball, before substitute Jason Scotland, who had been on the field a matter of minutes, fired low past goalkeeper Simon Brown's despairing dive. United went on the dominate the Cup final, but lost out by a single goal to Celtic in manager Martin O'Neil's final game in charge of the Parkhead club. They may be in different divisions, however this will be the third time they have met since Hibs were relegated at the end of the 2013-14 season. Dundee United went into this game just one point off the top of the table, with the performances of Nadir Ciftci, Stuart Armstrong and Gary Mackay-Steven helping them be a force to be reckoned with. Hibs, who went into the game on the back of a six-game unbeaten run, roared back from going a goal behind three times in a thrilling 3-3 draw, eventually taking United to penalties. After John Rankin's penalty miss Hibs were handed the chance to book a semi-final spot, but Matthew Kennedy could not convert his chance. Conor Townsend made it 7-6 to put all the pressure all on David Gray, and goalkeeper Radoslaw Cierzniak deflected the ball over the bar to win it for the visitors.